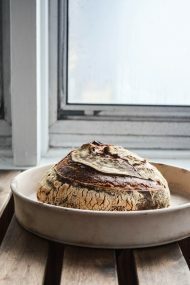 Working with sourdough conjurs feelings of “too difficult” or “fussy”. I say this because before I began working with sourdough starter six months ago these were my exact feelings about it. Some days being responsible for two human beings and a cat is more than I want to be tasked with (much as I love them all!). The idea of needing to keep one more thing alive was more than I thought I could handle. Then I fell hard for the starter that was gifted to me just after Thanksgiving. 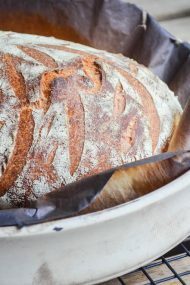 Once you understand its nuances, you learn it actually makes baking fresh bread an easy task (really!). We had a fast and furious relationship, fresh baked bread threatening to overtake every moment of my time (and counter space). Six months later, my starter and I have fallen into a groove and understanding. Some weeks it spends a good deal of time in the fridge, doing it’s thing slowly while I tend to other life matters, as was the case earlier this week. Before setting my starter in the fridge to slowly ferment, though, I made a batch of pizza dough to use on Monday. I only needed half the dough, and decided to tuck the remaining half in a tin, and stow it in the fridge to bake focaccia a day or two later. 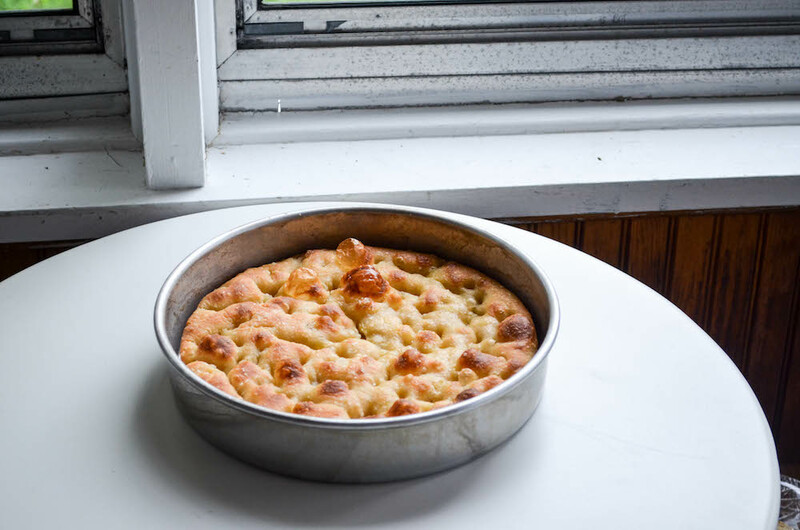 So, the first thing you need to make this homemade sourdough focaccia is a third of this sourdough pizza recipe (or you can make the whole thing, and split it between three tins, or two if you like thicker focaccia). Once you’ve made the dough, generously grease the bottom and sides a 10-inch (25-cm) tin. Add the dough to the tin, and spread it to the sides. Don’t worry if it springs back. Cover the tin tightly with plastic film, and set it in the fridge for 24 to 48 hours (the longer, the better, as it gives the flavor time to develop). Once the dough is chilled, you can stretch it to cover the entire bottom of the pan if it sprung back initially. The cold dough will stay in place easily. 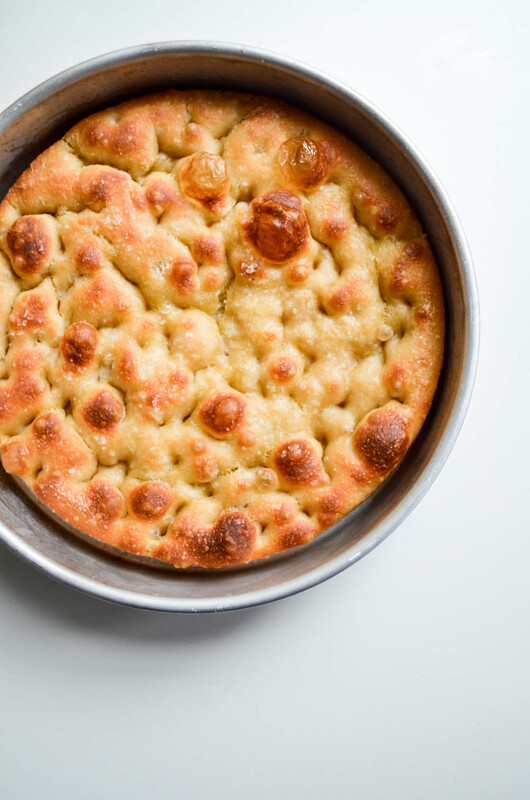 The night before you plan to bake the focaccia, take the pan out of the fridge, and set it at room temperature. Tuck in for bed, and preheat the oven to 425ºF (220ºC) when you wake up (or let it sit out at room temperature for eight hours if you’re baking at another time of day). Drizzle a few glugs of good quality olive oil over the top of the dough. Using your fingertips, gently, but firmly, press down to make indentations all over. Sprinkle with sea salt, and bake for 30 minutes until deep golden all over. Set the pan on a wire rack to cool for at least 30 minutes. 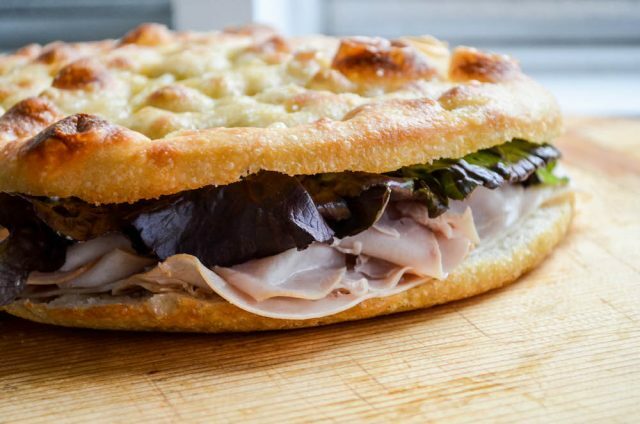 We love eating focaccia with our meals, but what I especially love about this focaccia is it’s perfect for making sandwiches. The only real effort here is the initial kneading when you make the dough, but otherwise, it’s relatively hands off, making it the easiest sandwich bread I’ve ever made, too. 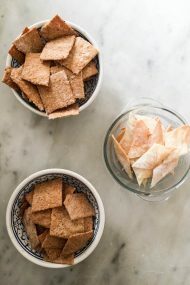 Once you knead it, and tuck into the pan, the rest is all time, so while it’s not the fastest bread, it’s certainly very easy with some advance planning. Usually, I don’t order sandwiches made on focaccia because there’s too much bread filling, so thick, it ends up being more bread than sandwich filling. This focaccia is thick enough to split down the middle, but thin enough as to not overwhelm whatever you decide to stuff between it. 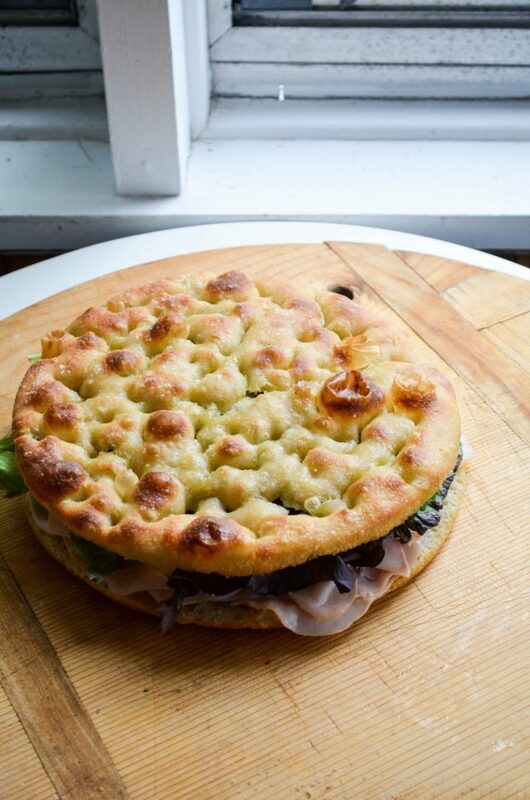 If you’re feeding a crowd, this focaccia is enough to make 6 to 8 sandwiches which is what I did recently when I donated a sandwich platter to our school Book Fair’s cafe.